I came down with a nasty sinus infection the Tuesday before turkey day. And knowing I would be stuck with a cranky baby who hates sleeping while traveling….I went to the express care clinic. After an hour I snagged some meds and care instructions, but I also found another knitter in the wild! A lovely older women was smiling at me from across the waiting area so I smiled back. She called me out on my knitting and not only correctly identified it as knitting but that it was also a sock. Brilliant! I didn’t get a chance to chat after that as I was called back to my appointment. I wonder if she had knitting in her purse? Another 24 points for #dcspigskinparty2015! My Neons are done and looking fine!! These turned out a bit snug. I’m not sure if they will be kept for my sock drawer or gift. On one side the colors definitely make me happy. But on the flip side I have another skein of flourmania in the stash so I could try again. Decisions decisions…. But for now I’m just going to look at and pet the pretties! I got sooo close. Like justan inch of ribbing and the bind off left. I’m just itching to get these done to turn in for #dcspigskinparty2015 points! I guess they shall be done soon enough and I’m not going to look the gift horse in the mouth for the extra knitting time. It’s finally starting to get cool here in the Midwest. And I have pulled out all our coats and woolies. I’m sadly lacking in the glove department. What’s a knitter to do but knit of course! 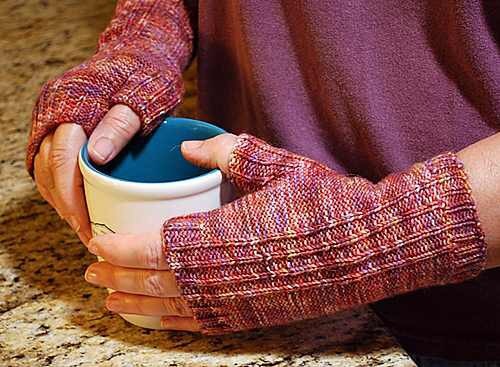 I trolled my queue and found the Reverse Rib Mitts by Holly Terrell. I pulled some Knit Picks Felici leftovers from my stash in the maple leaves color way and got started. 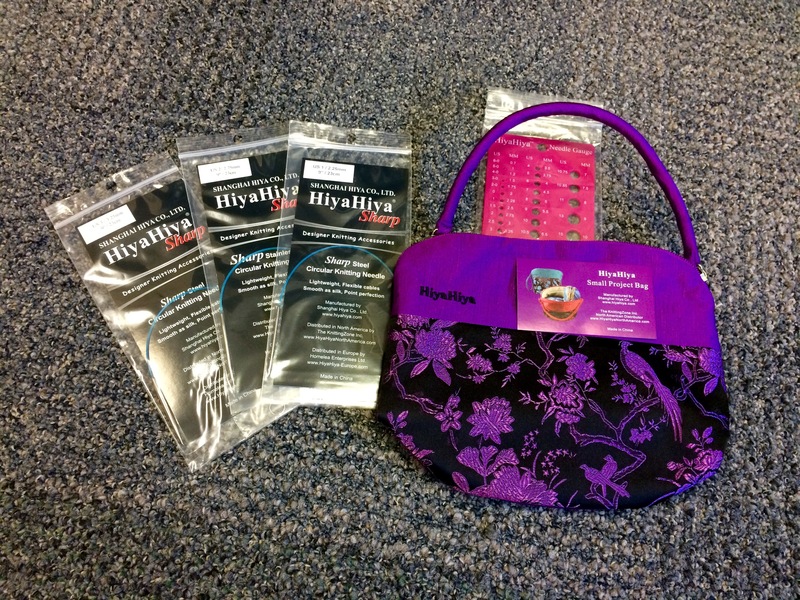 I even used my new Hiya Hiya sharps and project bag! The beauty of this design is that you work it inside out so no purling! All the beauty of reverse stockinette without slowing me down!! 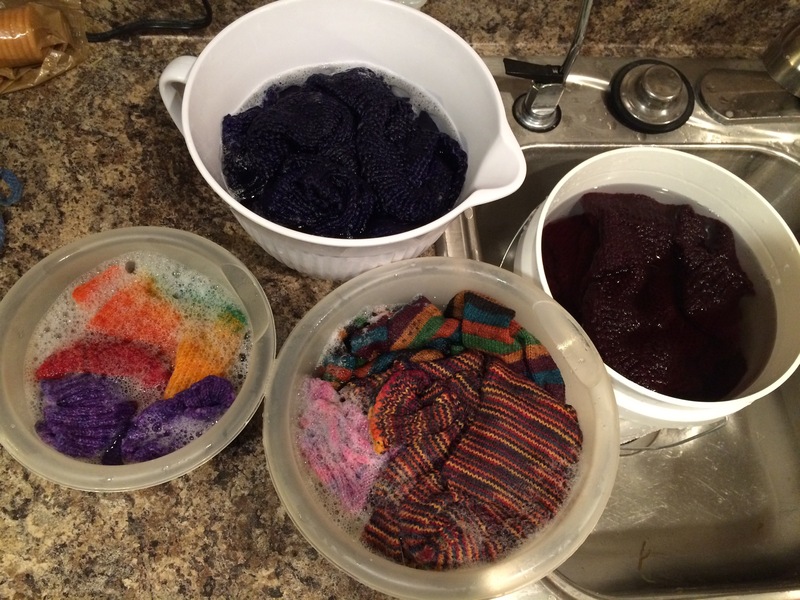 It’s hand knit washing time! I’m going to need more buckets! I was so excited about my Flying North socks. 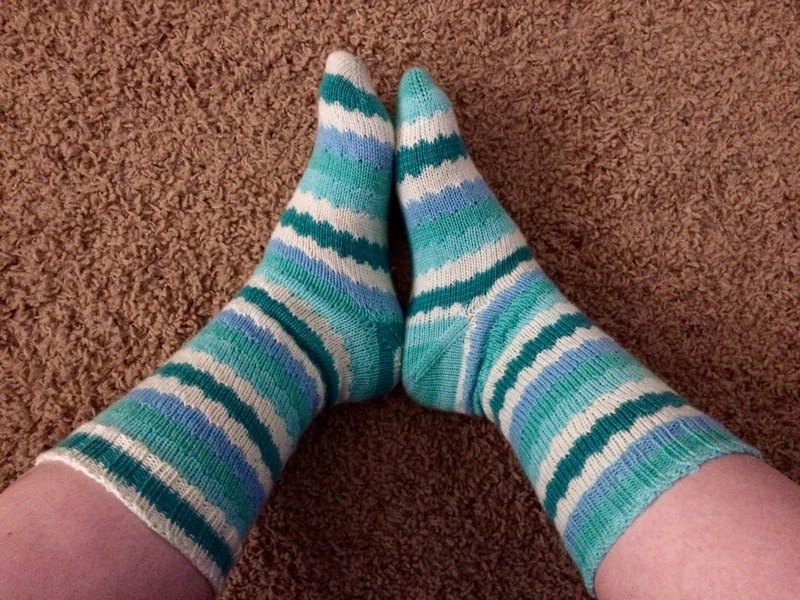 The plucky feet yarn is to die for! I was cruising along until that niggling started in my brain. 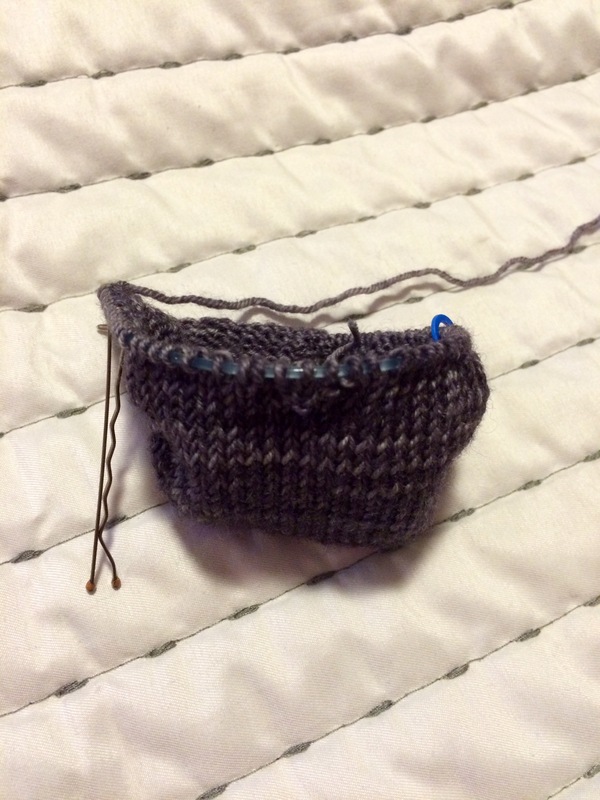 Something didn’t look quite right…and then it hit me I was working the pattern across the wrong number of stitches! 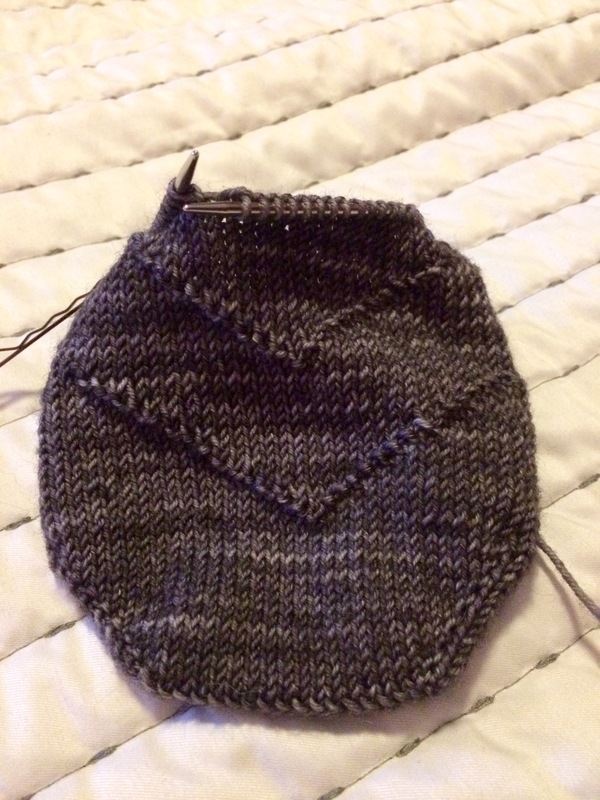 The pattern is written for 64 stitches which is too small for my feet at my gauge. So I went up to 70 stitches total but failed to redo the math for the pattern to account for the extra stitches. Doh! So I frogged back to the plain toe and started over with the correct math. (I was too lazy to get out of bed so yes, that is a Bobby pin as a stitch marker.) I lost a lot of knitting time redoing this but I learned two things. One, the stitches were very easy to pick up and I pulled the needles completely out. Second, I’m happy with this decision to frog. This yarn is just to special to have sloppy work! I guess I’m just getting more mileage out of this fabulous yarn! I’m on a sock jag lately as on can tell from my last few blog posts. So I decided to combine a couple of socks into one post so as not to bore the pants of you all with the never ending socks. 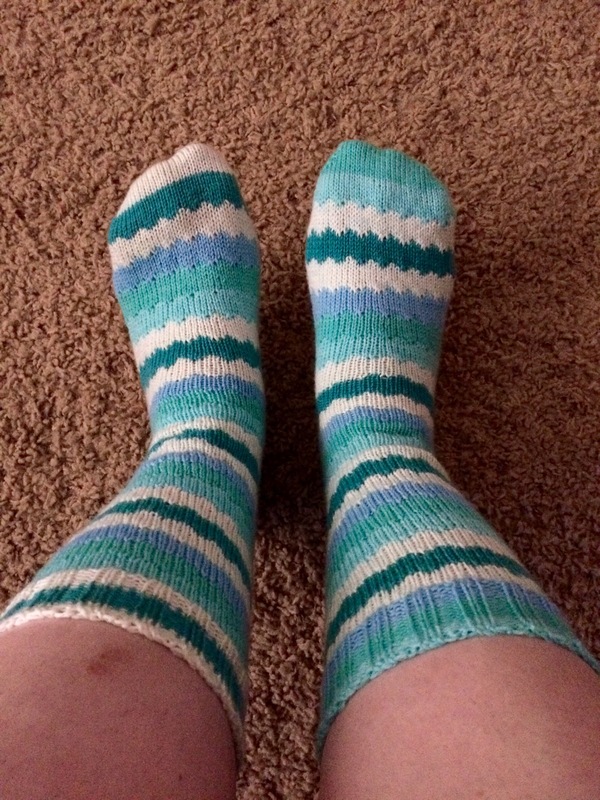 I finished the first sock in a frenzy of World Series glory of my Kansas City Royals! It’s my standard 68 stitch vanilla sock but honestly it’s a bit tight. Not uncomfortable but definitely a LOT of negative ease. Time will tell if these stay in my drawer or hit the gift pile. I’m already halfway up the foot of sock #2! These will most certainly be fraternal and it doesn’t bother me one but! 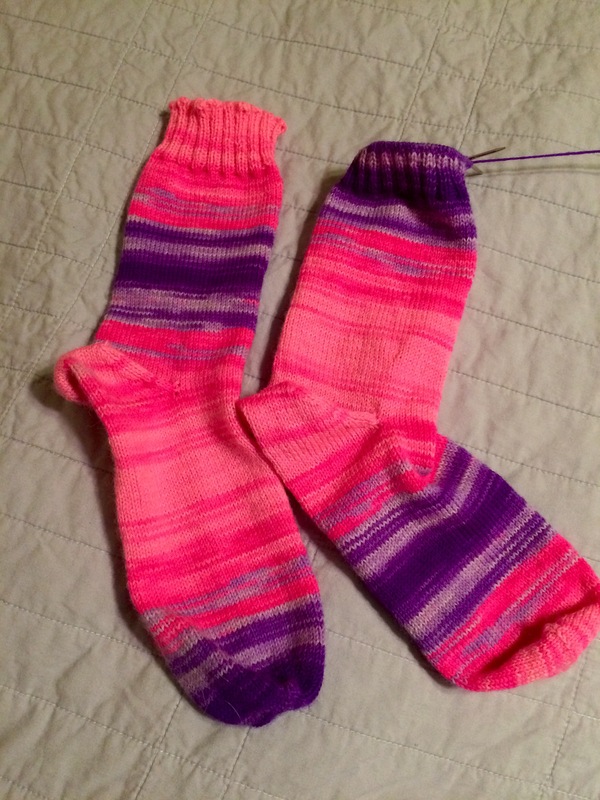 I can’t wait to finish these to count for #dcspigskinparty2015 and #operationsockdrawer! Next up are some new socks! 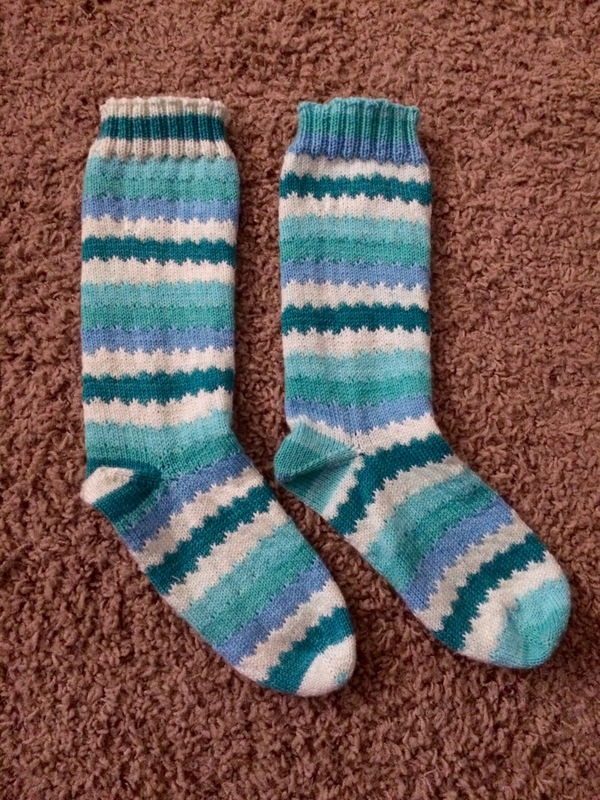 These are another pair of vanilla socks in Premier Yarns Wool-Free Sock Stripes. It’s an acrylic and polyester blend. I have no clue how they will hold up over time. 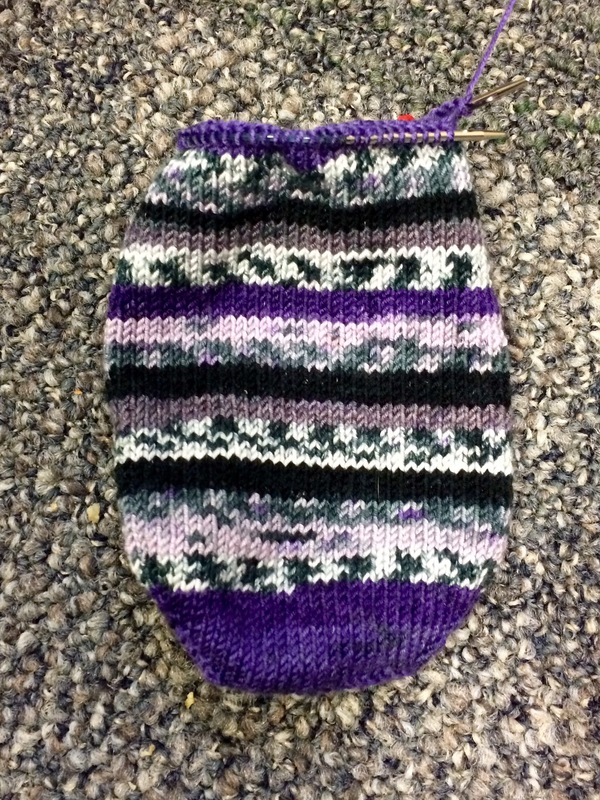 But the self patterning and colors are making my knitting heart happy. The fabric is also quite soft and smooth and very pleasant to feel. This is my current car project. 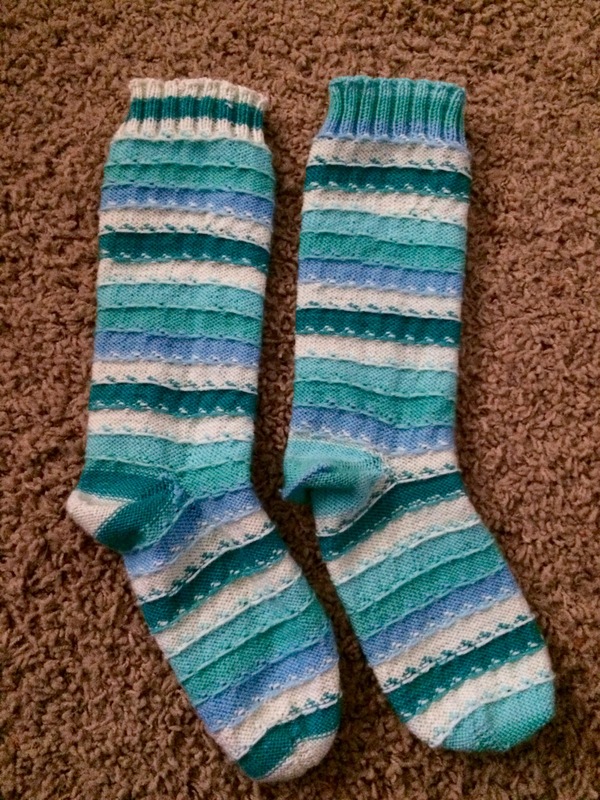 My Ocean Geek Socks are in the books! These turned out fraternal and gorgeous! The wavy stripes are the penultimate in potato chip knitting and quite literally flew off my needles. I turned these in for the Down Cellar Studio pigskin party. They scored me 24 points coming in with just under 400 yards of yarn used. This is my second project turned for this and it’s been a real hoot so far! 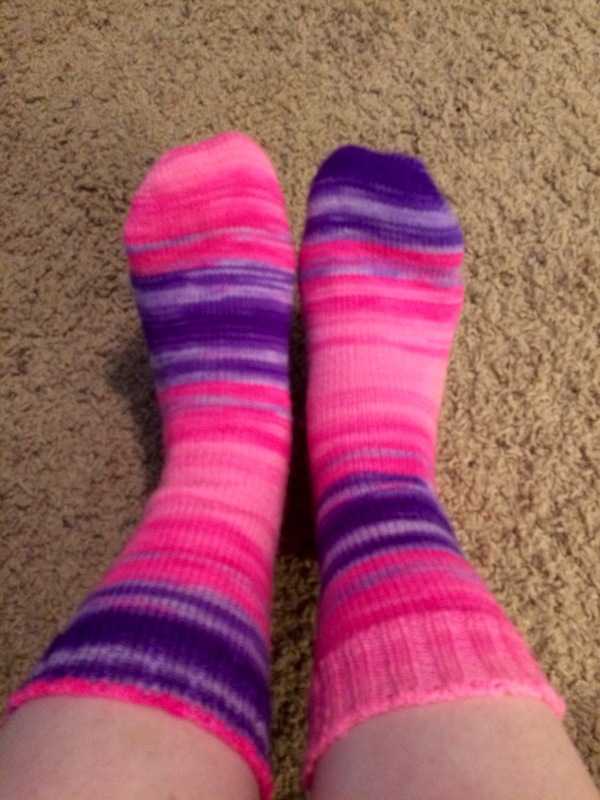 And of course the added bonus of another pair of socks for #operationsockdrawer and the coming winter. 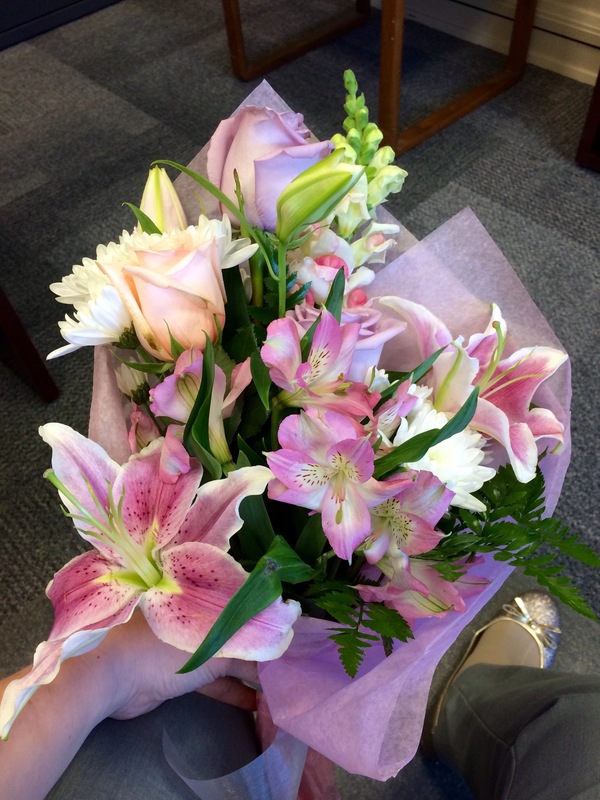 Today I turn….well let’s just say a respectable number and the hubby rewarded me kindly! First up, some lovely fragrant flowers! And then outdid himself with this..
A Hiya Hiya knitting set with small project bag, needle gauge, and 9 inch circs in US1, US2, and US3! I did have to give him a hint by sending him an Amazon wish list as his knitting muggle-ness is quite profound. But he chose very very well! This is my first knitting related present that I didn’t buy myself, lol. I think I’m going to cast on some fingerless mitts for myself tonight and put my new tools to use! My next socks are hitting the needles. 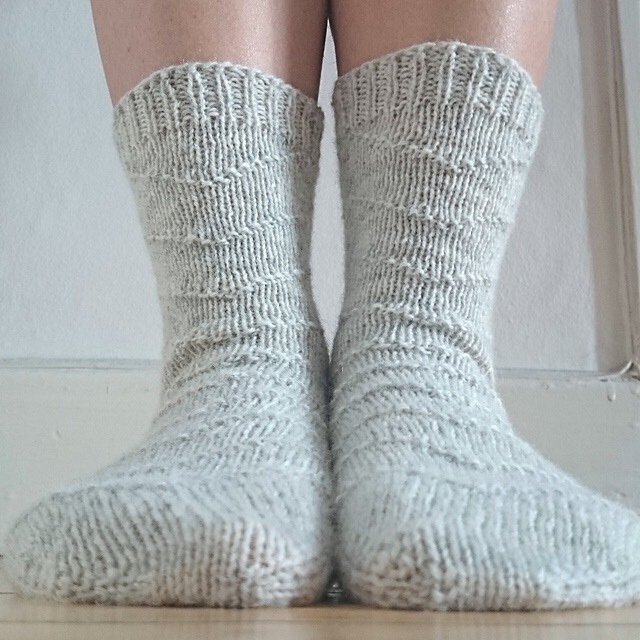 I’ve picked the The Flying North socks by Maria Montzka. 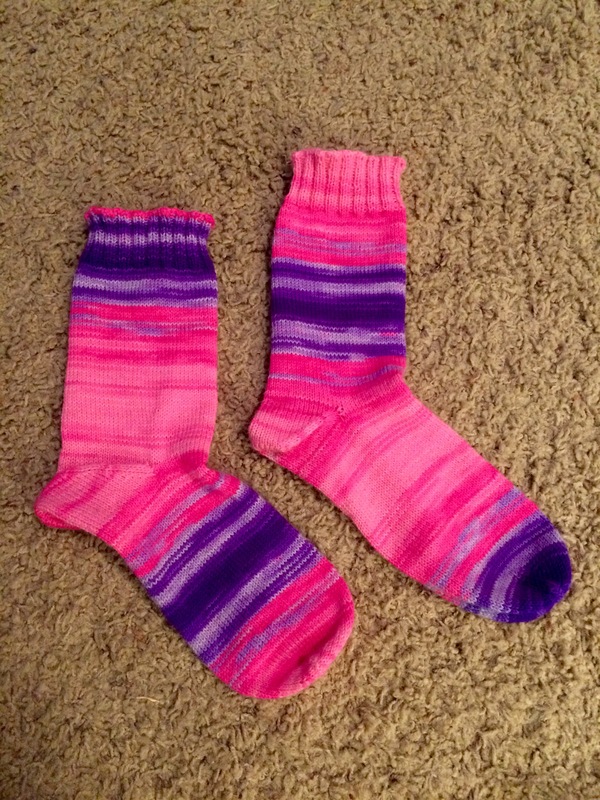 It’s free toe up pattern and should make my Plucky Feet semi solid yarn sing! I won this yarn last year as a part of Socks With Sarah contest. 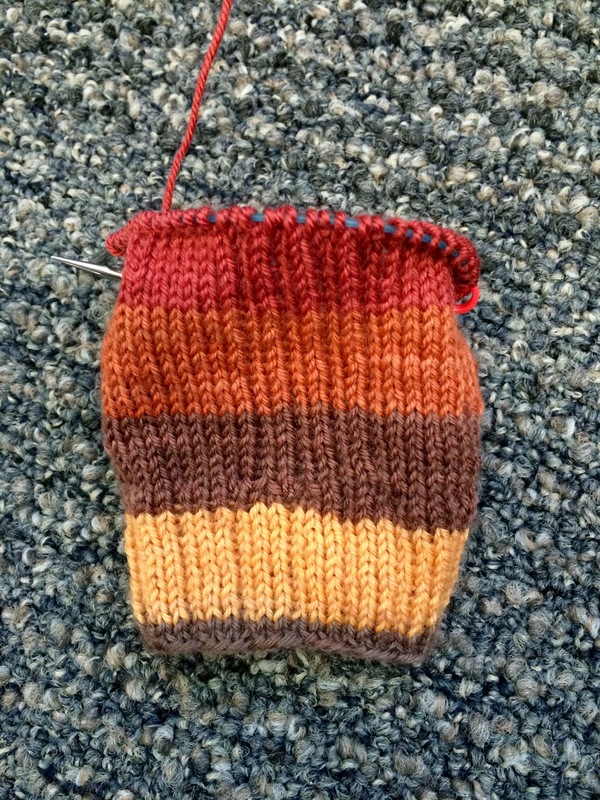 I’ve got the first toe cast on and set up to begin the pattern. Now on to the knitting!! Journeying thru the fiber world, learning new skills, being challenged and making connections. Pictures every day of the year! Do one creative thing a day, and stay positive. I chronicle my life as an aging homeschooling mother of seven--in nauseating detail. About my life in wool and yarn, and my explorations into the world of machine knitting. 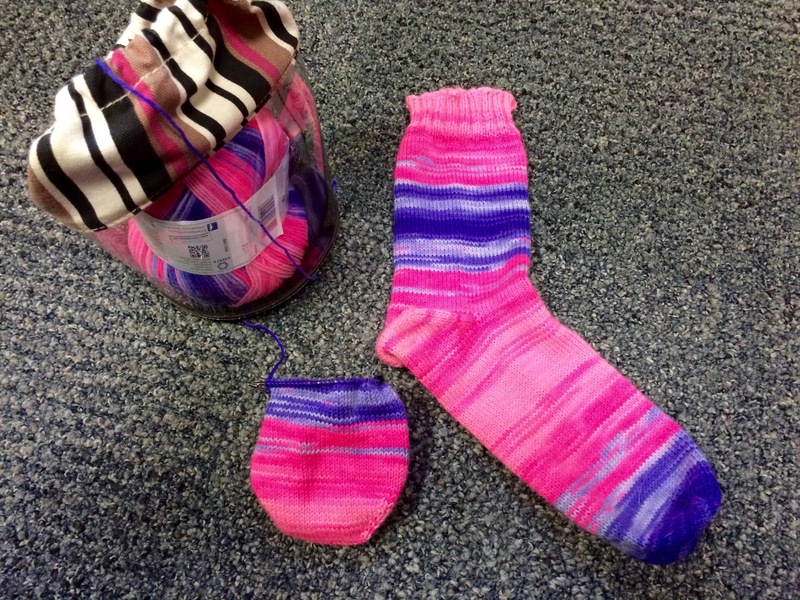 A blog about running and knitting. Not at the same time. 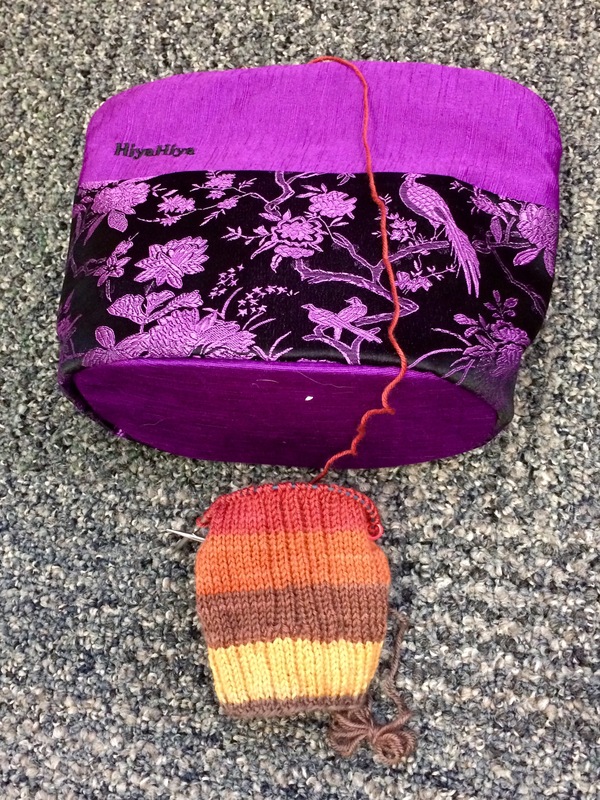 A knitter's humorous adventures with one hubby and three cats.